Godzilla vs Gigan, Polish film poster (1977) | 'TAIN'T THE MEAT… IT'S THE HUMANITY! Time for some more pretty pictures I think: here’s artist Romuald Socha’s poster for the Polish release of Godzilla vs Gigan from 1977. Originally released in Japan in 1972 Godzilla vs Gigan starred the giant irradiated monster (dinosaur?) as he battled to save the Earth from an alien beastie intent on invasion. Produced by Toho studios and directed by Jun Fukuda, the film starred Hiroshi Ishikawa and Yuriko Hishimi and was the 12th movie to star the hugely popular monster. To herald the Polish release of the movie artist Romuald Socha was commissioned to create the poster, and a top job he did too. Socha, an award-winning graduate of Warsaw’s Academy of Fine Arts, created a wonderfully evocative – and pretty creepy – image of Godzilla emerging from a slimy, insect filled mountain of gloop. 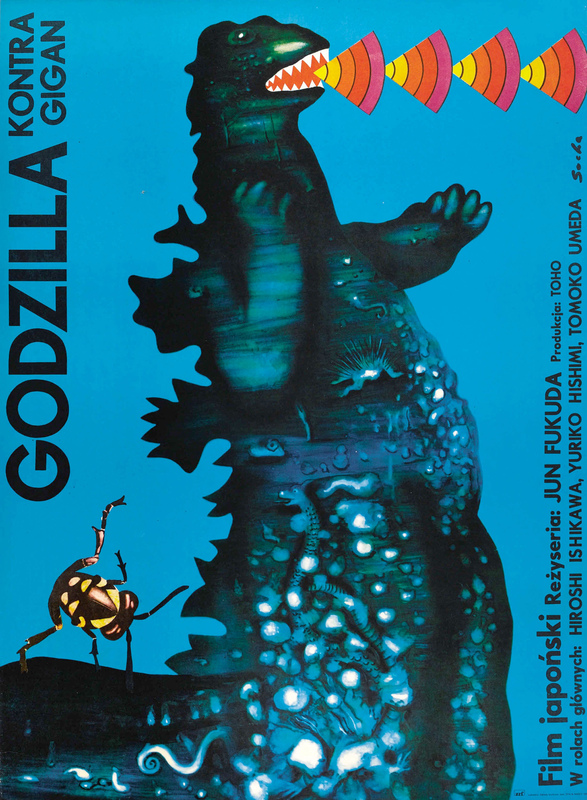 I’ve already discussed my admiration for Polish movie posters (click here for Alicja Laurman-Waszewska’s wonderful artwork for the original Godzilla) so it’ll come as no surprise that I’m a big fan of this poster too. I love the flat blue background and bold, clean type, as well as the triangles of ‘fire’ bursting from Godzilla’s mouth. During his long career Socha has created posters for films as diverse as Zorro, The Parallax View and Norma Rae and they all display his command of design and colour. His poster for Godzilla vs Gigan is no exception.